Today in the threshold of PDC - the world's largest conference for developers, Microsoft has published a number of its server and client products, including Office Professional Plus 2010 Beta.Poka this collection of software available to MSDN and TechNet. But it is expected that tomorrow, the opening day of PDC, the entire stack of products will be available to all comers. Put the new Office 2010, now it's in English! 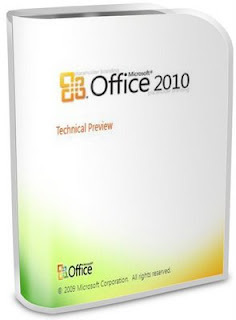 Microsoft Office Professional Plus 2010 and related products offer a business communications and collaboration platform. It presents several exciting advances for developers by offering substantially expanded platform services, a big leap in tools productivity, and longer strides as an open/interoperable platform. With Microsoft Office Professional Plus 2010, your people get a wide range of powerful new ways to do their best work from more places – whether they’re using a PC, smartphone or web browser. From insightful updates to Excel, PowerPoint, Word and Outlook, to new server integration capabilities that make it easier for everyone to track, report and share vital information, Office Professional Plus 2010 offers the complete package through familiar, intuitive tools. The new Microsoft Office Professional Plus 2010 Beta productivity suite is available in 32-bit as well as 64-bit versions. The Office 2010 suite has a new Broadcast Slideshow feature for PowerPoint, a new Word file menu that’s much more visual intensive, a new Office Communicator 2007 R2 integrated in Outlook 2010, and enhanced charts and graphs in Excel. • Protect your PC and data. Be sure to back up your data and please don’t test Office Professional Plus 2010 Beta on your primary home or business PC. • Uninstall any previous versions of Microsoft Office. We highly recommend that previous versions of Microsoft Office be removed from your test machine before installing OfficeProfessional Plus 2010 Beta. • Technical details/updates. Before installing the Beta please read the Release Notes. • Get Started with Microsoft Office 2010. Get all the technical information you need here. • Keep your PC updated. Be sure to turn on automatic updates in Windows Update in case we publish updates for the Office Professional Plus 2010 Beta. • Microsoft Partners. Learn more about Office Professional Plus 2010 on the Microsoft Partner Portal.